Massachusetts is known for its beautiful coastline, its rich colonial history and Red Sox baseball. Residents here also get the opportunity to enjoy all 4 seasons annually but harsh winter weather and balmy summers can be tough on your car. If you’ve got an old junk car or wrecked car, it can be difficult to get out an enjoy all that the state has to offer. But trying to sell to a private buyer is nearly impossible, and local scrap yards simply don’t know how to appraise damaged cars. 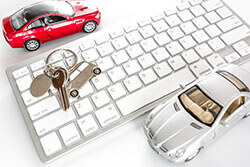 At DamagedCars.com, we are experts in buying less-than-perfect cars online and can get you an offer in 90 seconds or less. Most of our car offers are instant so that it’s easy to sell your car from the comfort of your own home. We’ll never pressure you to sell and are happy to give you time to consider our offer. And with free towing available nationwide, we’ll pick your salvage cars up at your home or office usually within 24-48 hours. What Do I Need to Sell My Car in Massachusetts? As your trusted Massachusetts junk car buyers, we want to make the entire selling process as easy as possible. So all you need to get started are your keys and vehicle title. Many sellers also find that having a copy of your vehicle registration is great for providing proof of ownership and a completed Massachusetts Bill of Sale is great to have for your records as an official proof of purchase. We will work to make sure that the Massachusetts vehicle title transfer process goes smoothly so that you can get paid fast. Lastly, before we tow away your old junk car, make sure to remove the license plates and hand them over to your local DMV. How Much Can I Get When I Sell My Car in Massachusetts? At DamagedCars.com, we always make personalized offers so that you can rest easy knowing you’ll get the true value of your car. Our “cash for cars” approach is specifically designed to put money in your pocket and free up valuable space around your property fast. We know that repairing a damaged vehicle isn’t always the most cost-effective option. Luckily, all it takes is 90 seconds or less online to find out what your junk car is really worth. Did you know that Boston built the first subway system in the US in 1897? If you’re stuck with an old junk car weighing you down, you might be forced to invest in public transportation. Instead of dreading your morning commute, sell your old damaged car online with us! Where Do You Buy Junk Cars in Massachusetts? We work with junkyards all over the state so that you don’t have to worry about towing your salvage cars away. Once you’ve accepted our offer, we’ll schedule a free pick-up with a typical turnaround time of 24-48 hours.